The Upper Geyser Basin had many different types of geysers and pools to wander by. We arrived well past midnight so we didn't get a good look around until the morning. Driving the winding roads through the park to our cabin when it was pitch black was pretty scary since we couldn't really see what was around us. When we woke up the next morning, we discovered that our cabin was only a short walk from the Old Faithful Geyser as well as several buildings including the visitor's center. That first day, we met everyone in front of Old Faithful to watch it erupt then we wandered the Upper Geyser Basin. Upper Geyser Basin - An encounter with a bison, walking through a surreal environment, and warming up in the steam. Castle Geyser erupts for a long time. 20-30 minutes of a vertical column of water that reaches 90 feet and then 30-40 minutes of noisy steam. 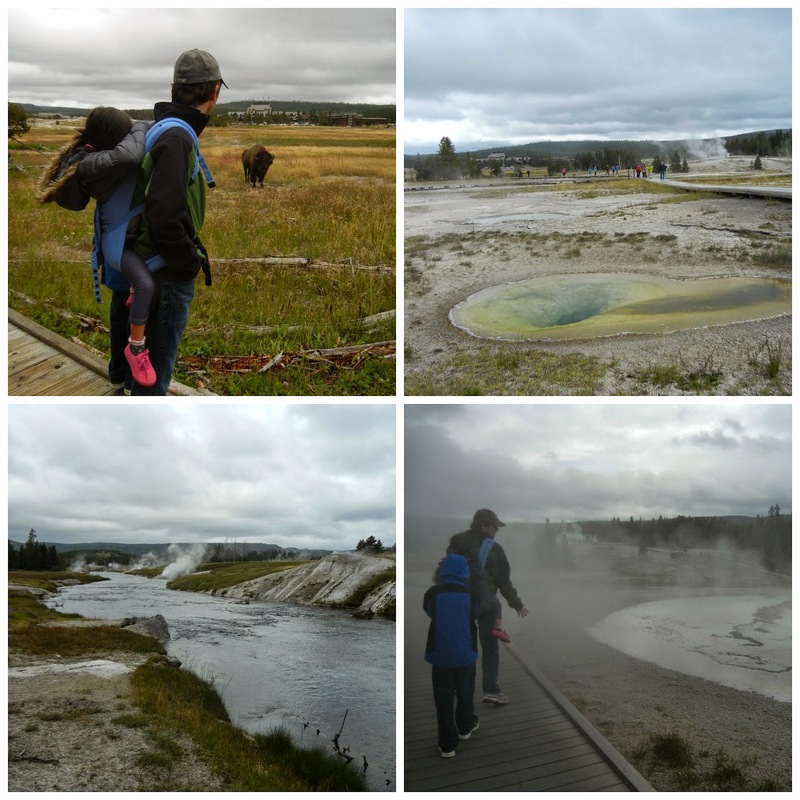 Since we were staying right next to the Upper Geyser Basin, we went there again on our last day so that the kids could complete their Young Scientist booklets. (We've always done Junior Ranger programs, but Yellowstone had the Young Scientist program as an option too. Neither were free here, but the completion prize was a nice patch or key chain.) Overall, we enjoyed the Upper Geyser Basin. 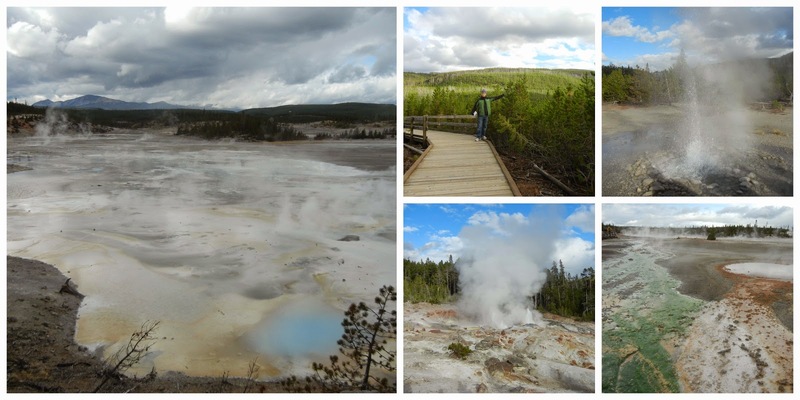 We were lucky enough to walk up to Castle Geyser and Beehive Geyser just as they began erupting. Jadon says Castle Geyser was his favorite while I think Beehive was my favorite. The amazing view from Observation Point. 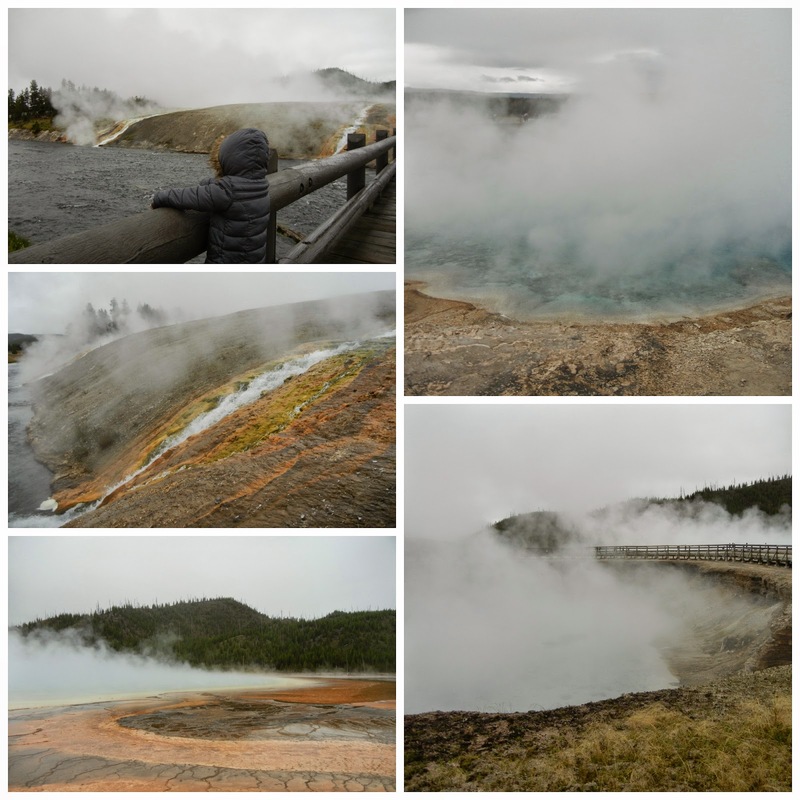 Jadon became a lover of Yellowstone on this trip. He wasn't super fond of the smells, but he grew accustomed to the walking and is ready to go back. On our last day, Andrew consented and took Jadon on the 1 mile round-trip trail up to Observation Point to overlook the Old Faithful area. He was a trooper and made it up to the top with little complaint. 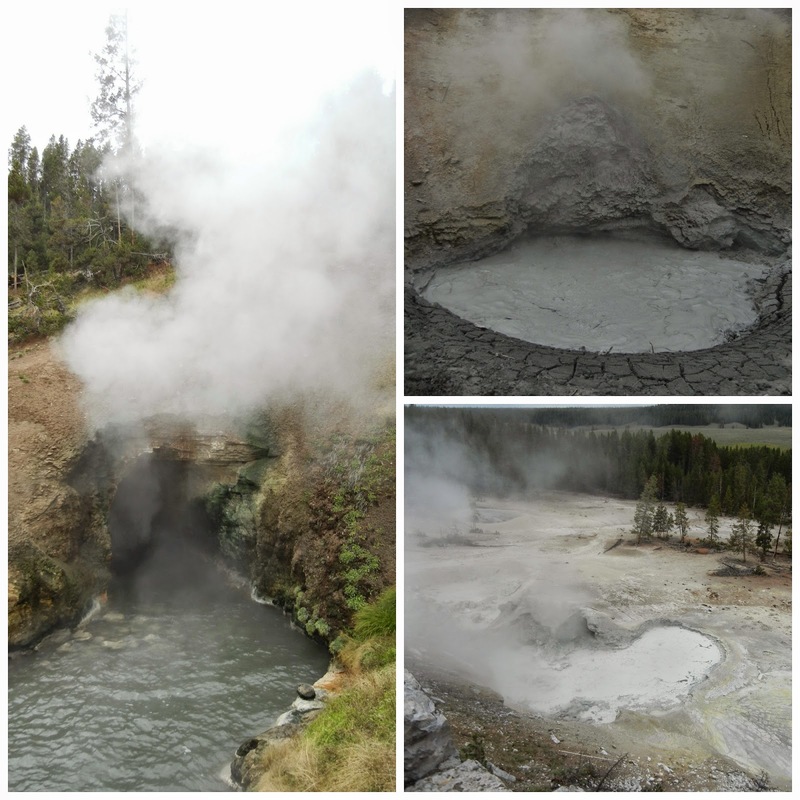 The Midway Geyser Basin and the Mud Volcano area were short loops we were able to easily complete. The Excelsior Geyser was huge and it had the prettiest colors in it even though the steam obscured it most of the time. The Dragon's Mouth Spring was probably one of the coolest things we saw at Yellowstone because of its uniqueness. It really did sound like a dragon breathing. 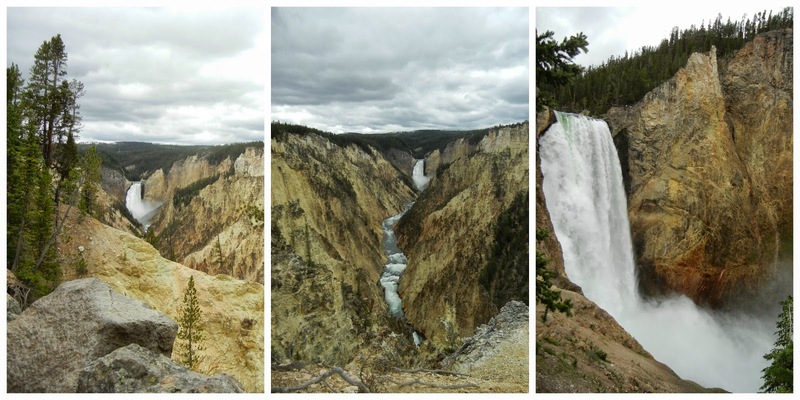 Grand Canyon of Yellowstone from afar and then up close. The Grand Canyon of Yellowstone was one of the most memorable places we went to. We went to the observation point first before several of us hiked Uncle Tom's Trail down for a closeup of the Lower Falls. This strenuous route drops 500 feet with roughly 300 stairs. Andrew, Jadon, and I ventured down with Andrew's dad first with Jadon bounding down the steps a little too fast which didn't help Andrew's fear of heights. We made it down just fine and then we made our way back up with small breaks between all the steps. The Norris Geyser Basin was probably my favorite of all the basins. The landscape here was absolutely spectacular and incredibly surreal. It reminded me of a post-apocalyptic book I read when I was younger with its vast colorful basins hissing with steam. We were in Yellowstone for three nights total. In that time, we had two and a half days to explore. We got a lot of sightseeing in, but we definitely didn't cover all of it. 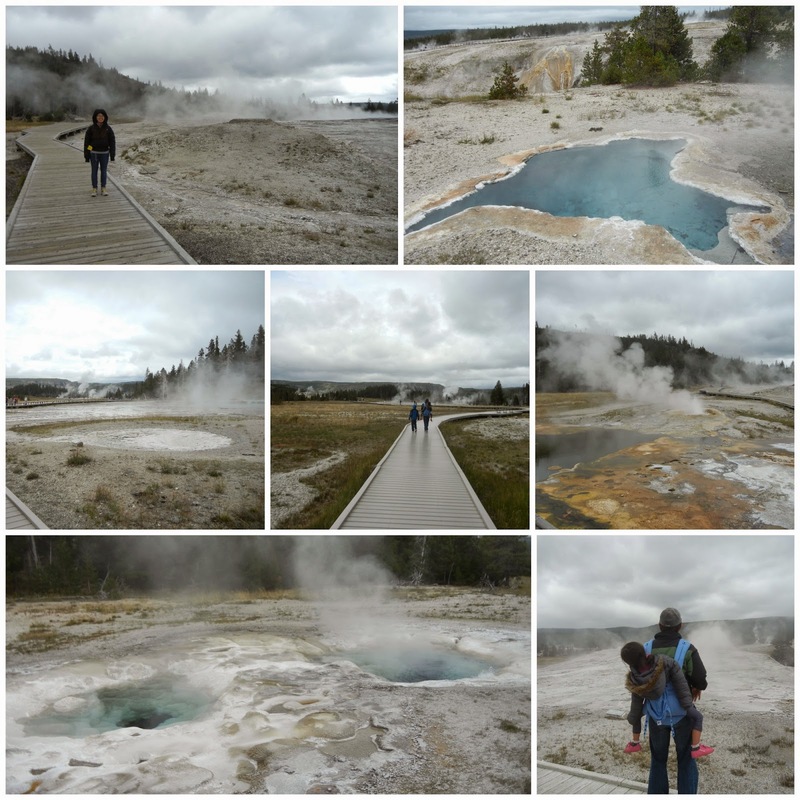 I was reluctant to go to Yellowstone, but I ended up having a blast there. This was a great trip and I'm glad we were able to go there with some of Andrew's family.